View of crescent Earth from space. 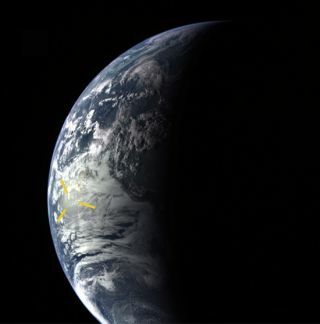 A glint of sunlight (marked with yellow lines) appears just west of the Galapagos and South America. The phenomenon that causes a diamond to sparkle could beused to find large bodies of water on rocky, Earth-like planets, says Darren M.Williams, lead author of a paper in Icarus that describes the process. The trick, he says, is to look for planets when they are increscent phase, ideally in orbits that lie at an edge-on angle to Earth. Inthat position, the glare bouncing off the water would make the planet seemunusually bright. "Crescent phase is where the starlight would beglancing off the edge of the planet toward our telescopes," says Williams,an associate professor of physics and astronomy at Penn State Erie. "Thatwould be when the light is coming at the surface at a very steep angle, and thespecular reflection would be the strongest and most intense." Williams ran simulations of idealized, cloud-free planetswith three types of surfaces: unfrozen land, snow and ice, and water. His goalwas to see to what extent the presence of water would contribute to the light comingfrom a planet in another solar system. He found that for slightly tilted systems the reflectionfrom water would be the most powerful signal, particularly if the planet wereobserved in crescent phase. When a star appears directly over a body of water,almost all the light is absorbed. But from a glancing angle, most of the lightis reflected. The shape of the light curve would help distinguish Earth-likeplanets with water from those without. At the University of Florida, Dr. Eric Ford has also beenlearning about how light can reveal the presence of ice, sand, vegetation andwater. Asymmetry in a planet's light curve over time could indicate majorseasonal transformations or weather patterns caused by the ebb and flow ofclouds. Warmer, ice-free planets, for example, might experience alarge bloomingevent of plants or oceanic algae, changing the way the planet reflectedlight. Scientists could detect those changes by looking for certain signaturesin the planet's colors and measuring their intensities. While fluctuationswould signal some type of surface feature, scientists would need a lot morefollow-up before they could say for sure what was causing it. "It could be water and land, it could be some otherliquids, particularly where it's further out where you might have methane, like onTitan," says Ford. But, he explains, scientists could rule out manyalternatives using other methods. "If we have an idea of how far away the planet is fromthe star, and how bright the star is, then maybe we could say methane would notbe liquid at those temperatures," for example. Scientists could narrow thepossibilities by comparing their findings and might conclude the only logicalexplanation is the presence of water, "particularly if there wasspectroscopic evidence of water vapor in the atmosphere," says Ford. Looking at Earth-sized planets beyond our own solar systemwill require advanced new telescopes using modern technology to its fullpotential. Two proposed efforts, NASA's Terrestrial PlanetFinder (TPF) and the European Space Agency's (ESA's) Darwin mission, will bothhave instruments capable of picking up the sparkle of an ocean. The way those instruments are designed and built will bebased, in part, on the results of what Williams sees of Earth from Mars andVenus. Williams is using observing time on ESA's Venus Express andMars Express orbiters, to lookat Earth from interplanetary space. From Mars, all of Earth's phases can beseen, but from Venus, only Earth's gibbous (more than half-full) and fullphases are visible. Regardless, Williams can use the results to test hispredictions. "That's the most exciting application from mystandpoint," he says, "the observation of extreme glint off the Earth'soceans as seen from MarsExpress." Looking at terrestrial planets while they are in crescentphase, when only a small fraction of their disk is illuminated, will beextremely difficult, perhaps taking two or even three weeks of observing time.But, as Williams points out, of all the extremely difficult measurementsastronomers plan to do, it might be one of the easiest.